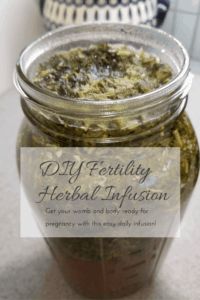 A nourishing herbal fertility infusion (power tea) can help you beat infertility or boost your chances of conceiving by preparing your womb and body for pregnancy. Whether you are trying to conceive naturally or are using reproductive technologies such as IUI, IVF, or even donor eggs, this natural nourishing mix of the fertility herbs nettles, red raspberry, and oat straw will boost your fertility and increase your chances of a successful pregnancy. After two years of repeated early miscarriages, and being told I had high FSH, endometriosis, and diminished ovarian reserve, I was given only one shot of trying IVF before the doctors would say my only option was donor eggs. I did everything I possibly could to prepare, including drinking a glass of this nourishing infusion every day. I got pregnant naturally in under three months and never wound up trying that one shot of IVF! These herbs- red raspberry, nettles, and oatstraw – are incredibly gentle and nourishing herbs. That is why I recommend this infusion for EVERYONE trying to get pregnant, regardless of their “infertility” diagnoses, or their method of conception. There is no reason why you shouldn’t continue this while trying IUI or IVF, or preparing for a donor egg cycle, as they are such gentle and nourishing herbs Unfortunately, doctors often get nervous when you say “herbal remedy” because there are so many herbs out there that are super powerful and can affect your hormone balance. So, your doctor may advise you to stop taking the infusion while you cycle. I personally wouldn’t take anything related to hormonal balance- like red clover leaf- while cycling, but these three herbs I’ve identified are fundamentally nourishing and safe while trying to conceive in any manner. However, if you are on blood thinners (beyond baby aspirin) for your cycle, then you might consider dropping the nettles from this infusion. You can drink this infusion throughout your cycle, and some people drink it throughout their pregnancy. Out of an overabundance of caution, people (like me) who are terribly afraid of early miscarriage will not drink nettles or red raspberry during the first trimester, even though midwives would say it is fine. This infusion is recommended, however, in the third trimester, to prepare the body for birth. This infusion should taste nourishing and yummy. When you drink it, you should enjoy it and feel like it is providing your body with the nourishment you need. If you don’t like it, it doesn’t taste good, or it just doesn’t feel like the right herbal combination for you, then maybe it isn’t! Do some research into medicinal herbs for fertility and consider if another herb (or a combination of other herbs) is right for you. I recommend the nourishing infusion of nettles, red raspberry, and oat straw, because they are so gentle and so nourishing that they will help prepare the womb and body for anyone trying to get pregnant. Before I get into the details of the recipe, I want to spend a little time talking about each herb and why it is helpful in preparing for pregnancy! Nettles are one of the most nourishing herbs. According to Susan Weed, the herbal healing guru, a one quart infusion of nettles contains more than 1000 milligrams of calcium, 15000 IU of vitamin A, 760 milligrams of vitamin K, and plenty of most B vitamins. Its reputation is as the herb with the most chlorophyll – the substance thought to be what makes “green” superfoods like wheatgrass, so helpful to getting pregnant. Nettles provides a food source of folate (food-based folic acid) (crucial for a healthy pregnancy) and tones the adrenal system which then provides additional energy for the body to focus on making a baby. Drinking a nettles infusion is basically like having two servings of leafy greens- only better. Your body needs optimal nourishment in order to have the energy to grow healthy eggs, develop a perfect uterine lining, and sustain a pregnancy. Also, if you have eliminated dairy, as I suggest may be necessary for some women trying to conceive, you need to ensure you are getting enough calcium. Nettles is the right herb for the job. For a single nettles infusion, take 1 cup of dried nettles and put into a quart mason jar. Fill the jar with boiling water, cover, and steep overnight or for at least 4 hours. Strain, and drink warm, hot, cold, whatever your preference. I like nettles straight up- some add a little honey. Drink 1 to 3 cups a day. Nettles is probably safe throughout pregnancy, however, out of an overabundance of caution I chose not to use it after I confirmed my pregnancy with a blood test. I did use it in my third trimester to prepare for birth. Warning! A strong nettles infusion can lower your blood pressure, lower your blood sugar and thin your blood. For most women trying to get pregnant this is helpful. But, if you struggle with one of these conditions already or are medicated for one of them, avoid a simple nettles infusion, and don’t overdo the suggested amounts in the three-herb infusion. Red Raspberry Leaf is THE uterine tonic in the herbal world. Anyone trying to conceive, whether they are just starting or have been struggling with infertility, whether they are trying to get pregnant naturally, or using IUI, IVF, or preparing for a donor egg transfer, should be using Red Raspberry leaf. Red Raspberry leaf is full of vitamin C, vitamin E, calcium, iron, vitamin A, vitamin B, and many minerals. It promotes healthy menstruation (including managing excessive menstrual bleeding), improves egg quality through nutrition, assists in the healing of the uterus after surgery, and may lengthen a short luteal phase. It is most well known for toning the uterus however, and for this reason, it is thought that using it in preparation for pregnancy can even prevent some kinds of miscarriage (especially those associated with uterine lining/implantation issues). Just like nettles, if you want, you can take this as a simple single infusion, using the directions above. While Red Raspberry is probably safe throughout pregnancy, and is recommended by midwives as a remedy for morning sickness and a miscarriage preventative, out of an overabundance of caution I chose not to use it after I confirmed my pregnancy with a blood test. I did use it in my third trimester to prepare for birth. I should note there is a bit of an online controversy about using Red Raspberry Leaf during the two week wait, due to a single study that showed that in some doses it caused pregnant rats to have weak contractions. However the authors of the study say it was inconclusive and that the effect depends on pregnancy status. I used it during the two week wait of my successful pregnancy, and many women drink it throughout the first trimester (and have for hundreds of years). I don’t believe it is dangerous- instead I believe it is helpful, toning the uterus and increasing blood flow right when you need it (the two week wait). Most midwives and herbalists agree with this. However, if you would prefer to be more cautious, you can only include it in your infusion from menstruation to ovulation. Oatstraw is the super gentle, nourishing grasses of the oat plant. Both oats (the grain) and the oat grasses are incredibly nourishing, and soothing to the system. Oatstraw promotes a strong and calm nervous system, and healthy endocrine system- something that is absolutely crucial when trying to conceive. 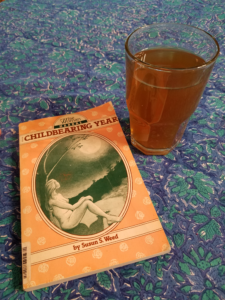 Susan Weed in her book “Healing Wise” writes, “ Avena [oatstraw] eases spasms and inflammation throughout your being, allowing engorged cells to relax, release fluid, and cool off.” This sounds to me like exactly what we are trying to do while attempting to conceive! Reduce inflammation (which can cause ovulation and implantation problems) and calm the body so that it can receive that little embryo and nourish it! Oatstraw is high in vitamin C vitamin A, calcium, iron, potassium, phosphorus, the vitamin B complex (including folate), vitamins E, G, and K, and fiber. Finally, oatstraw helps to stabilize your blood sugar- something that we all know is crucial in a fertility friendly diet. Oatstraw is absolutely safe throughout pregnancy- no worries there. If you have Celiacs and need to strictly avoid all gluten, consider purchasing a gluten-free oatstraw like this one from Oregon’s Wild Harvest. I do want to mention one other herb that is very helpful for some women struggling with “infertility” but that I did not personally use when trying to conceive- Red Clover. Red Clover is a fertility herb with very high vitamin and mineral content. This herb helps balance hormones, and potentially, helps unblock fallopian tubes. It is often used to help regulate an irregular menstrual cycle. If you have blocked fallopian tubes, an irregular cycle, irregular ovulation, or unexplained infertility, consider substituting red clover in for the oatstraw in the above recipe. Because I didn’t have those conditions, and because red clover is thought to have an estrogenic effect on the body (which might be bad for endometriosis, which I have), I did not use red clover. The herbalists over at Natural Fertility Info seem to dismiss my concerns however, and tout Red Clover as a wonder herb. It just might be- if you read about it and it sounds right to you, try it. If it tastes good and makes you feel good, use it! Again, out of an overabundance of caution due to my history of endometriosis, I avoid it. 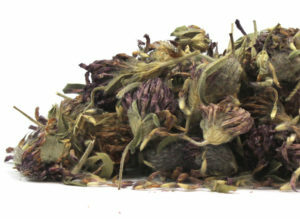 For sourcing herbs, if I have to make a bulk order, I order from Mountain Rose Herbs. Unfortunately, they charge for shipping, but they are a well-respected organic herb supplier. 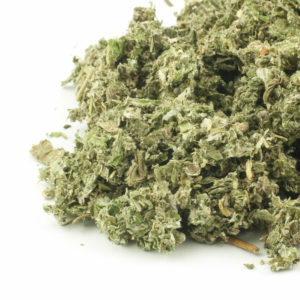 Luckily, Amazon has plenty of “prime” free shipping options so you can get your herbs quickly. I’ve ordered both Starwest and Frontier from Amazon when I want to receive my order within a day or two. I have never had problems with quality from either. Of course, wild harvesting them yourself is the best :-). Unfortunately, this suburban girl ain’t got time or access for that. In the kitchen, I am all about efficiency. Since this is a regular part of my nourishing fertility diet, I want to make this infusion quickly. Also, even though it might be slightly better for me, I don’t want to have to make a new infusion every night. 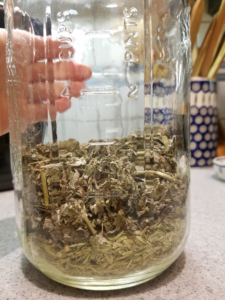 So although you can use a 1 qt mason jar with ⅓ cup each of Nettles, Red Raspberry, and Oatstraw, I prefer to use a larger 2 qt/64 oz mason jar. This produces six cups of the infusion, and I drink two cups every day for three days. That way I only have to do this every three days instead of every day or every other day! First, measure out ⅔ cup each of Nettles, Red Rasberry, and Oatstraw. Place the dried herbs into a 2 qt mason jar. It should measure up to about the 2 cup mark, or just beyond. I tend to be overly generous. Boil 2 qts of water. A note on boiling water: If you don’t use an electric kettle to boil water you should probably get o ne! Ours boils 2 qts of water in under five minutes. If I’m only boiling a cup of water it takes under a minute. Seriously, these things are amazing! BUT, you have to get a non-plastic kettle, otherwise you risk phthalates leaching into your water. Phthalates are toxic endocrine-disrupting chemicals that wreak havoc on your fertility. We scoured the internet to find a kettle that has absolutely no plastic touching the water, and the inside of the lid is stainless as well. It isn’t the prettiest thing (there were prettier ones that were more expensive), but it is made in the U.S. (Wisconsin! ), and stays cool on the outside so you don’t have to worry about burnt fingers. Pour your safe, phthalate-free, boiling water over the herbs and fill up your mason jar. I usually do a circular motion to try to get all the herbs under the boiling water, but it doesn’t really matter. Place the lid on the mason jar and steep overnight or for at least four hours. The infusion will be a nice dark color when ready. Fertility Infusion ready to strain! Strain the infusion using a fine wire-mesh strainer. I kind of press the liquid out of the herbs with a wooden spoon, but it’s not really necessary. I usually rinse the mason jar, and put the strained liquid right back into it. Enjoy, warm, cold, hot, anyway that tastes best to you! I prefer it a little chilled. If you compost, the leftover herbs are AMAZING activators. Nettles have a lot of nitrogen, so we never have to buy anything else to help our compost decompose! 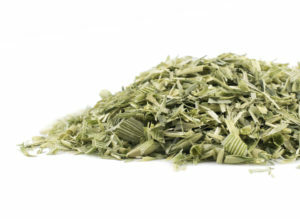 A gentle, nourishing herbal infusion to use every day while trying to conceive. Prepares the womb for pregnancy. Add nettles, red raspberry leaf, and oatstraw to a 2 qt mason jar. Add 2 qt boiling water to jar. Steep overnight or for at least 4 hours. 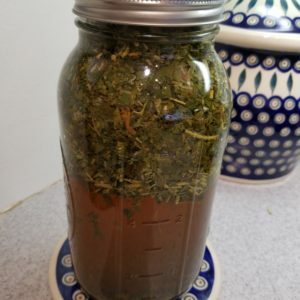 Strain liquid and discard herbs (they make great compost!). Enjoy 2 cups each day! Lasts for three to four days in the fridge! 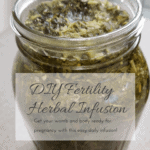 Are you ready to start your daily herbal fertility infusion? Have you already been doing this? Do you love the taste? Leave a note here to commit to your daily infusion! Hi Anna – for those of us avoiding gluten, is the oat straw ok to use? Good question! In theory, the oatstraw could have been processed on a shared machine with wheat, and so, it is possible that some gluten residue could remain. For those with celiacs, I would find a gluten-free oatstraw. it looks like Oregon’s Wild Harvest makes some- https://www.oregonswildharvest.com/bulk-oat-straw-tops-cs-organic. If you have tested negative for celiacs but are avoiding gluten in general, it would be a personal choice (I wouldn’t worry about it). If you haven’t had any testing done, then you might want to go with a gluten free option just in case. I’ll update the post based on this concern! Thank you! 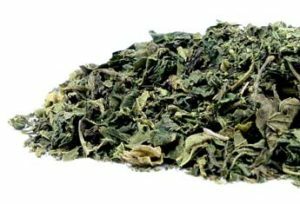 If I don’t use the organic nettles leaf, should I be adding more red raspberry leaf and oatstraw to the recipe? If using Red Clover, should I use the blossoms or the leaf? Or a mix? Get the blossoms! If some leaves come, don’t worry about it, but order the blossoms! Thank you so much for your entire blog. I’m just starting my journey of mommy-to-be but unfortunately my RE is stating that I have a very low AMH. I’ve done some research and I also have very low Vitamin D which could be affecting my AMH level. We are awaiting our next appointment now that the blood results are back to learn what our next step is. I’m only 27 and my husband is perfectly healthy. We are hoping that age is the best thing going for us and the fact that I have no other issues besides low amh. Your blog, advice and story is so inspiring. I look forward to trying everything you did on your list and praying, praying, praying that we get a little miracle baby. So glad you found the blog!! I will say a prayer for you and your husband that you find your miracle baby!!! Low AMH isn’t the end of the world- best of luck getting to the bottom of everything and becoming as happy and healthy as you can on your journey!! Love your blog but OMG this herbal infusion tastes TERRIBLE! Hahaha you made me laugh!! Try cutting down the amount off herbs! If you still don’t like it, try making simples with just one herb. Maybe your body needs 1 but not the others! Good luck! I’m lucky I love the taste! Thank you for such a well detailed blog. How long after making the infusion before storing in the refrigerator? Also can I add a little honey? Thank you! It is very forgiving in terms of when it goes in the fridge. I usually pop it in after straining it- so after it infuses overnight. But there have been plenty of times when I have totally forgotten about it and strained it almost 24 hours later and then put it in the fridge. Except for having an exceptionally strong taste, its been just fine! I personally don’t add any sweetener because I have an egg quality issue so I avoid any sugars, sweeteners, or sweetener replacements that might spike my insulin! Its up to you how to manage your own diet! Also, the one ndbags seem huge!How long do they last? A long time!!! At least a month or two! It’s up to you! Whichever herbs sound like they will be the most helpful for you!! I have had surgery to remove fibroids. After the surgery one of my tubes is blocked and the other is questionable. Doctors have said it is impossible to get pregnant. Can the red clover tea help to unblock my tubes? I am afraid to drink this tea because I hear it can increase estrogen levels. Having too much estrogens can have fibroids come back. Please help…thank you. I’m not a naturopath or doctor so I can’t advise you or speculate. But I personally never drank red clover because I also did not want to increase my estrogen levels. It might make more sense for someone who has low estrogen levels. I’m wishing you great luck in unblocking your tubes my dear!! I believe there is a great facebook group all about naturally unblocking tubes- I don’t have the link, but search in facebook for it and you will find it! Hi Anna, I’ve been reading your blog for the last week. So much amazing content and research. A million thanks for all the time you’ve put in here. Question—my acupuncturist doesn’t want me drinking things that are cold. Did you have that same advice? Do you heat this or drink it cold? Hi Ann!! You are so welcome!! Your acupuncturist is smart. Drink room temperature or heat up like a tea. But, I’ll tell you, its a lot more palatable chilled from the fridge! But its more important to keep that uterus warm!! I love this herbal tea. I think it taste pretty good and it definitely feels nourishing! I let mine steep for 5 hours. 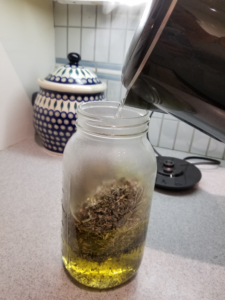 I know the longer I let it steep, the stronger the taste, but I was wondering if steeping it overnight increases the nutritional value when you drink it? I want to get the maximum nutrients this tea provides 🙂 thanks! Yay! I’m so glad you like it!!!! I feel the same way- totally feels nourishing! I think it probably does get more, because the taste gets way more intense the longer you steep it. 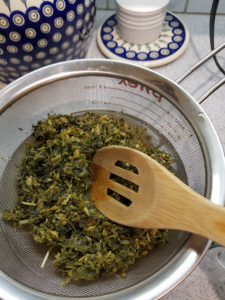 Once I steeped it for two days and it was not quite as delightful :-D. I almost always let it steep overnight because I’m too lazy to pour it after 5 hours 😛 I wouldn’t stress about it– maybe do a taste test and if you still like it longer do it longer? Hi Anna! I’m wondering how you feel about purchasing a red raspberry tea that has nettles, etc. already in it. I’m guessing of course it’s best to make one’s own, but how important is it? Thanks!! The real difference isn’t about if you buy it pre-mixed, its about how much you are steeping, i.e., a tea vs. an infusion. So, if you find a hippy midwife at a fair selling huge packs of pre-mixed red raspberry, nettles, and oatstraw (or whatever your preferred mix is) and she tells you to use about three cups in 2 qts of boiling water and steep for 4 hours then perfect! BUT if you are just buying little tea packets, you’d have to use like 40 of them to get the kind of nutrient value as the infusion- and that would be wicked expensive. BUT if you don’t want to do the whole infusion for some reason, go ahead and buy a pre-mixed tea, have a few a day, and just be mindful (i.e., imagine the nutrients from the tea warming your womb, helping your blood circulate, giving energy to your ovaries, etc.). Do what works for you! I hope that all makes sense! 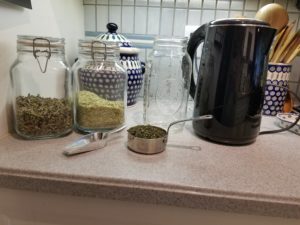 Hi Anna, do happen to have a link to purchase the big mason jar containers with airtight clip lids that you show in the picture, in which you are storing the dried herbs or teas? I feel it is so hard to find good airtight jars for storage that are free of any harmful substances. Hey Anna! After years of discouragement with low ovarian reserve, being told there is nothing medically that can be done, I can’t begin to tell you what an encouragement your blog has been 🙂 you’ve given me so much hope as my husband and I begin the journey to parenthood! Quick question on the tea- do you heat it up or do you drink it cold from the fridge? I’ve tried it both ways and like it.